The new Occasions Mini catalog is out and in full swing! There are SOOO many new projects in the catalog it's hard to know where to begin. All three of this month's projects use at least one item from the mini catalog. 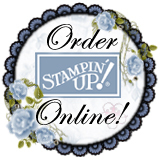 Sale-a-Bration: This is Stampin Up's biggest promotion of the year. For every $50 you spend in merchandise, you can have any item from this mini catalog for FREE!!! The last page of this catalog also lists many stamp sets (these sets have a special SAB item number so they'll appear free... if you use the catalog item number, you'll be charged full price) from the big catalog that are also available as a FREE product. This promotion is effective thru 3/31/11. Imagine this... making a cute card and NOT having to cut anything!!! Sound like a dream come true? Wha laa... your wish has been filled! We'll use the Create a Cupcake stamp set and the coordinating punch. The punch does all the work for you! You can choose between a girl (mambo) and a boy version. Okay, confession here... the girl version has only ONE stamp on it! ... the mini tag. Along the same lines as the Cupcake Card, the Big flower card uses the new stamp set called Build a Blossom and coordinating punch. Again, no cutting necessary. The small inside flower is stamped in craft white, applied white embossing powder and used the heat tool to emboss it. The center flower is a new accessory in the mini catalog called Adornments. They work perfectly here. They are like a button, but don't have a hole for thread, or a underside loop (I'm sure there's a technical correct term for that thingy)... they are flat and ready for a glue dot. This project has LOTS of choices: designer paper (which really sets the tone for your card), flower color(s), ribbon, edge punch (above the ribbon) and words. Whew... you know how I love choices! and punch (yep, again, no cutting) 4 scallop circles to create the flower. Did you know SU has 2 different size scallop circle punches??? Sponge the punched pieces, ball them up, open them, insert a fancy smanchy brad and you are done with the flower! LIsa, this one is for you!! !